Buy Online, Pick Up in Store, Save More! Hosting 101 - 10 Tips to Make Guests Feel Welcome! You already know the Macy’s Weekend Sale & Clearance is going on right now, right? If you paid attention this week, I told you to get a leg up on the sale by putting your favorite items in your bag and then coming back today to checkout at the lower price. 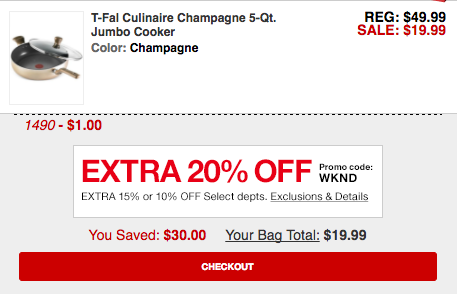 What you don’t know is that I’ve been stalking the T-Fal Culinaire Champagne 5-Qt. Jumbo Cooker I first told you about when I wrote the “Healthy Batch Cooking Tips” post a few weeks back. One downside to writing about all the great deals at Macy’s is that sometimes I forget to actually click through and shop the very sales I’m telling you about after I put them on Magic Style Shop! I was despondent when I missed the sale on the Jumbo Cooker, and the price hasn’t dropped below $49.99 since. 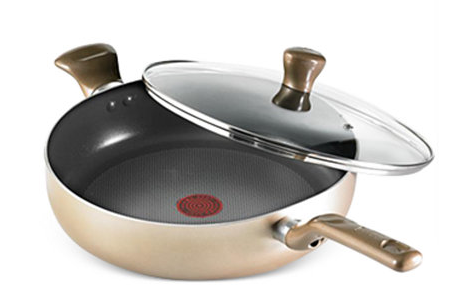 So imagine my delight when I logged on just now to find the price not only dropped to the lowest I’ve ever seen it on Macys.com (just $19.99! ), but I could get it in one of my favorite colors: champagne! Not only was the Jumbo Cooker the lowest price I’ve ever seen, but as I clicked to checkout, I discovered I could save even more. By simply choosing to buy online and pick up my purchase at my local Macy’s store, I’ll get an extra 15-20% off my next store purchase. Don’t worry, I didn’t make the same mistake twice; I’ve already checked out and chosen the pick-up option. Depending on when you checkout, there is even the possibility to pick up your order the same day. So go ahead, find your favorites online and remember this rule for your shopping playbook: buy online, pick up in store, save more!